Your guide to the working holiday visa. The working holiday visa is a document allowing you to legally work while holidaying in a country. 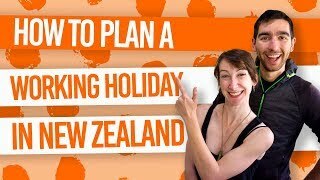 There are many countries which have these “working holiday schemes”, but we personally think the New Zealand working holiday scheme is the best of the bunch for totally biased reasons. We’ll go more into detail on what is a working holiday visa in the article below. Essentially, the working holiday visa in New Zealand allows young people, usually aged between 18-30 years old, to work temporary jobs throughout 6, 12 or 23 months in New Zealand in order to fund their travels. Although there are a set of requirements and conditions of the visa, it is fairly straight-forward to apply for online. Applying for a working holiday visa might just be what you need to start the adventure of a lifetime and discover what life is like in another country. Allows you to get experience working abroad. Work so you can afford to travel for longer. See more of the country than what a ‘tourist’ sees. Get a great balance of work and play. Spend up to 6, 12 or 23 months in New Zealand. Who can get a working holiday visa to New Zealand? Residents from 45 different countries can apply for a working holiday in New Zealand. However, there are a set of requirements and conditions on the visa that differ depending on what your country of origin is. The easiest way to check whether you qualify for a working holiday visa in New Zealand is to use a handy widget like the one below. Just fill in your details to see if you are eligible. It’s free to use so what have you got to lose? What do you need to prepare for the working holiday visa application? Conveniently enough, the working holiday visa to New Zealand can be applied for online. Plus, most of the requirements for the visa, such as having travel insurance, doesn’t have to be proven until you get to the immigration desk when you arrive in New Zealand. Even then, the immigration officers don’t always check your supporting evidence. (However, we recommend you have supporting evidence prepared on arrival just in case). All you need to apply is your passport, a Visa or MasterCard to pay for the visa application fee of NZ$208, and about 45 minutes of your time to fill out the application form. Check out New Zealand Working Holiday Visa Application: The Complete Walkthrough to see how to apply online. In some cases, like applying for the 23-month visa if you are from the UK or Canada, you will need to have a medical certificate and chest x-ray. However, this is more likely to be asked via email after you have made your application. The first step to planning a gap year in New Zealand is getting the working holiday visa. This is the first thing you do before booking any flights or joining any gap year programs. Although the working holiday visa only allows you to enter New Zealand within a year of receiving it, the 6, 12 or 23 months doesn’t actually take effect until you arrive in New Zealand. Your visa starts when you enter the country. There are some countries that have a quota on the New Zealand working holiday visas, meaning there is only a set amount of visas for that country per year. Those visas only come out on set dates of the year, so if you are from one of those countries, you need to be prepared to apply for the visa the very second the quota opens! Getting these visas are very competitive. If you took the Free Eligibility Test above, you can view when the quota opens to apply for the working holiday visa. Otherwise, head over to the Quota Updates page of workingholidaynewzealand.com for up-to-date quota reports. How to apply for the working holiday visa for New Zealand?